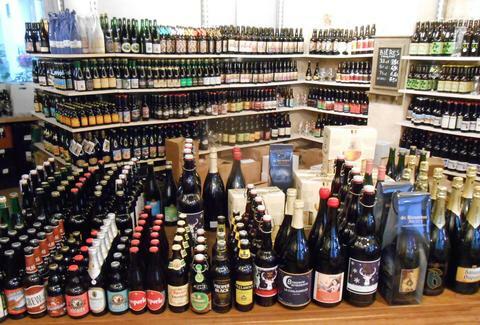 Start your adventure at La Cave, one of the city’s most well-stocked craft shops -- you’ll find over 100 artisan Franco-brews, plus imported stuff like Belgium’s vaunted Cantillon, with a focus on natural & organic numbers. The owner Simon is crazy well-versed on the world of beer and will be happy to guide you along in your education process on artisan French micros. Also, he speaks English, which helps. With 20 brews on draft and over 150 bottles (not to mention a gorgeous wood & stone-laden interior), this is definitely one of the best spots for crafts in the city, and it should come as no surprise that there’s a connection with the Cave a Bulles store; the owner Simon also has a stake in this place too. Their selection reps mostly French numbers, but also slings a solid number of British, Belgian, and German beers too, and they recently started selling growlers, which is a fairly new concept to the country/continent. 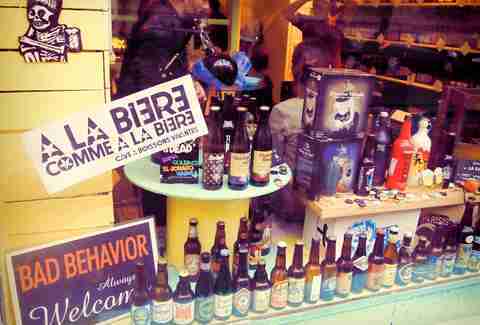 You may be surprised to learn that in Paris proper, there is only one craft brewery. One. 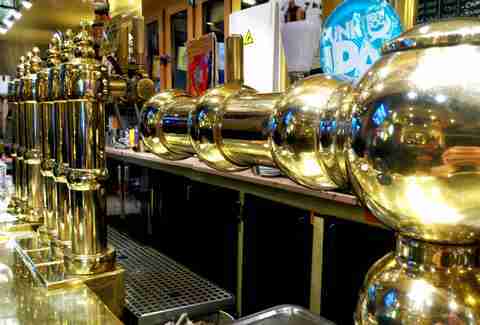 Fortunately, Thierry Roche has a good thing going, and since launching in Fall of 2012, has hit the ground running, stocking local bars with his delicious beer and making an effort to get people in Paris to appreciate "bières artisanales". Inspired by the multicultural neighborhood where he makes his beer -- Goutte d’Or -- all of the beers are named after streets in the area. You can buy directly from the brewery, and -- bonus! -- check out the brewing facilities Thurs-Sat. If you were in search of a Parisian dive bar that’s filled w/ genuinely nice locals, look no further. The jukebox spills out indie rock, and they'll happily let you grab a pizza from across the street to eat in, because the focus here is on drink, and they do it damn well. They have a trio of rotating beers on tap (mostly from local hops) while the bottled beers come from well-known micros like Thiriez... and there are enough to make for a five-page menu. Planted right on the backside of Montmartre, this spot is both a beer boutique and a bar, letting you takeout/drink in any of their 100+ selection, incl. pints from the (only) local microbrewery just down the street, Brasserie de la Goutte d’Or. 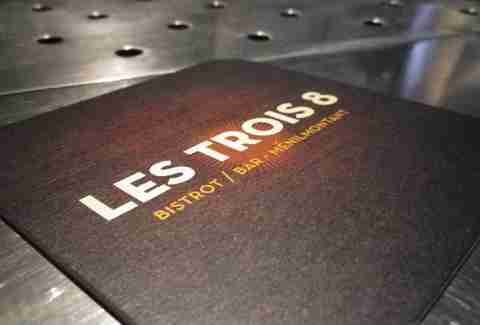 Slapped right in the Belleville neighborhood, Les Trois is certainly off the tourist-beaten path, but with eight craft beers on tap and over 80 in bottles, it's definitely worth a visit. Like a classic cave à manger, they also serve charcuterie and cheeses (all artisan of course), and they also happen to stock a healthy selection of US numbers like Oregon's own Rogue. 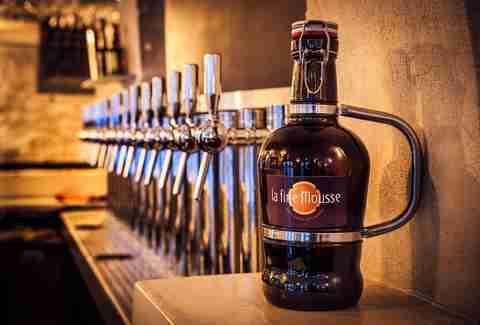 Located near the Gare de Lyon, Express de Lyon is a solid pre-or-post (or, let's face it, mid)-trip stop to grab a beer. Sporting a basic, down-to-earth vibe brought out by classic brass taps and tile floors, it feels much more like a classic French sports bar (there’s always a soccer match playing on the big screen) than anything else. 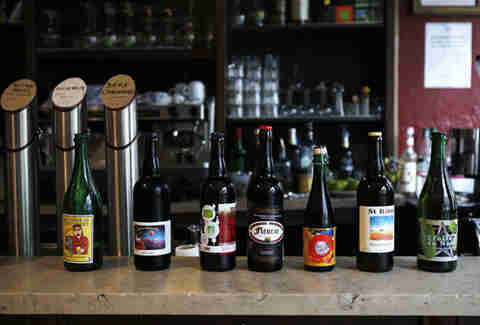 The beer selection, however, pulls in the artisan drinkers from around the city, who're there for the 15-tap/30-bottle lineup of beers from breweries like Mikkeller, BrewDog, Kernel, and Belgian uber-brewery Bosteels. 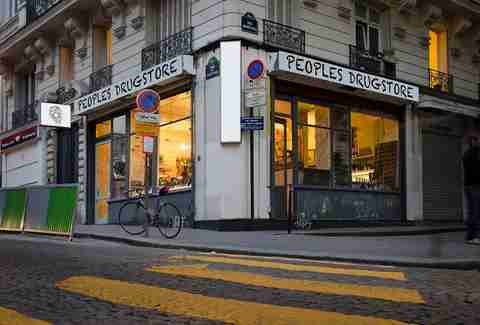 If you’ve got an evening to walk around Montmartre and Sacre-Coeur, stock up on beers at People’s Drugstore. The old corner storefront has been turned into mecca for hop heads, and though it's predominately a take-out, if you’re in luck, you can crack one open and play a round of chess in the space (or maybe just the first thing). They’ve got crafts from France and some of the big players from across the pond, totaling up to more than 500 options. The most amazing thing? The prices are fixed: €3 for 25-50cl bottles and €6 for 75cl bottles no matter what you buy.